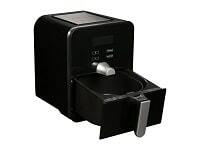 Rosewill has come out with a newer model of their hot air fryer, the Rosewill RHAF Oil Less 1100W Low Fat Air Fryer, 2.5 quart/2.4 L now available in black (RHAF-15001) or white (RHAF-15002). Recommended as a must-have modern home kitchen appliance, the main useful features of the air fryer are its oil less cooking method and its multiple cooking choices as well as its ease of use appeal. Has your doctor recommended less oil in your cooking, less fat in your diet? If so, then the hot air fryer might help you achieve just that without having to give up on your favorite fried food. You’ll still get to enjoy flavorful fried food but minus the additional calories from the oil. 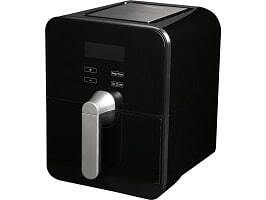 This review of the Rosewill RHAF Oil Less 1100W Low Fat Air Fryer, 2.5 quart will reveal to you that fast and convenient oil free cooking of fried food is possible. Using the hot air fryer for low fat meals is simple and fuss-free. The concept of frying without oil is indeed appealing. 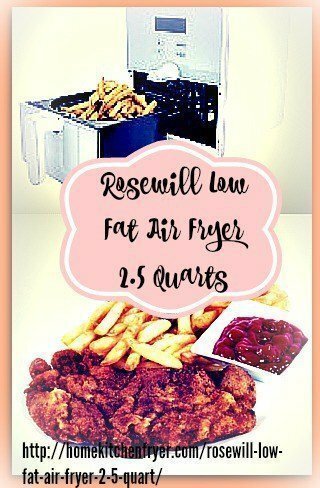 How does the Rosewill 2.5 quart air fryer works? It cooks using rapidly moving hot air engulfing the food ingredients 360 degrees. The heater element gives out precise temperature control up to 392 degrees Fahrenheit. The mechanical fan blows the hot air at high speed over the food at all angles ensuring even cooking and browning. Food is cooked using hot air instead of immersing in hot oil. The food cooks faster using the air frying machine than a convection oven but takes longer to cook compared to a traditional deep fryer. However, your air fried French fries has 80% less fat compared to the ones deep fried in oil. 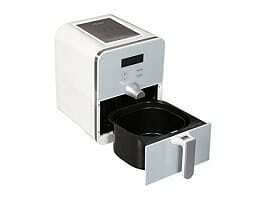 This Rosewill air fryer model has a cooking capacity of 2.5 quarts or 2.4 liters. 4 portions of French fries can fit into the 2.5 quarts cooking basket. You should be able to cook for a family of 4 using the 2.5qt cooking basket. The maximum weight for fries for best results is 17 ounces each time. You can get a rough idea of how much is 17oz by comparing this to a large portion of Mcdonald fries which is about 5.3oz (150gm). There is a maximum level marker inside the cooking basket. You should not fill up with food above the maximum line. It comes fitted with a digital LED display glass panel. Its touch button controls are easy to press. There is a plus and minus button for temperature and timer control. It has variable temperature control from 122 – 392 degrees Fahrenheit. Its cooking timer is up to 60 minutes. A quick reference guide is available on a small metal plate on the top part of the air fryer. Recommended temperature for steak is 360 degrees F for 8 -14 minutes, drumsticks is 15 -22 minutes at a temperature of 360 degrees F.
All you have to do is place the food ingredients in the cooking basket, press the correct time and temperature and the machine will finish off the cooking. For reheating food, recommended temperature is 300 degrees Fahrenheit for a duration of about 5 – 10 minutes. Crispy food will still remain crispy. In fact, if you reheat restaurant bought food, excess oil will drip out and you’ll end up with less oily food. Beside frying food, you can also use it for roasting, baking or grilling. Just get the temperature and time correct. For example, for baking muffins, you set it at the highest temperature and bake for 10 – 15 minutes. A manual guide is also given that states the recommended time and temperature for a number of common foodstuff. Whenever the basket is removed during the cooking process, the safety switch kicks in and the machine pauses operation. When basket is inserted back into machine, timer continues and cooking resumes. If internal temperature is higher than 176 degrees Fahrenheit after cooking is done, the fan will continue turning until a safe temperature is reached. Appliance switches off automatically if cooking time is not set within 5 minutes after machine is switched on. The machine is fitted with double protection circuits. Make sure there’s a free space of 6″ on all sides of the machine when in use. This is for good air circulation purposes. Air vents should not be blocked when cooking is in progress. Do not place anything on top. The Rosewill air fryer comes with a detachable non stick cooking basket and drip pan. The Rosewill brand does not have their own air fryer accessories. However, this is not a major problem as you can use those from other brands as long as these can fit into the cooking chamber. Always make sure that these accessories sit on top of the frying basket and drip pan to collect the excess oil that drips out during the cooking process as well as to ensure proper hot air circulation at all angles including from the bottom. Its cooking basket, pan and interior walls come with a non-stick coating. This makes cleaning easy. Since no oil is added or at the most 1 tablespoon of oil, there is no oily mess to clean up. Kitchen countertop does not have a greasy layer to it. The removable basket and pan are dishwasher safe. You can also wash these in warm soapy water by hand. 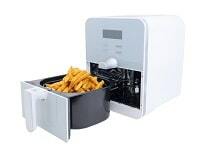 Judging from customers feedback and reviews of the Rosewill RHAF Oil Less 1100W Low Fat Air Fryer 2.5 quart, the fryer cooker lives up to their expectations of a healthy low fat home fryer. Compared to the more expensive Philips air fryer that comes with a number of optional air fryer accessories, the Rosewill air fryer cooker does not have any except for the cooking basket. This does limit its cooking options. For example, the Philips digital airfryer comes with a double layer wire rack that allows for 2 layers of food to be cooked at the same time. However, Philips digital air fryer cost more than double the price of the Rosewill air fryer. There are many benefits using an air fryer. An air fryer is especially time-saving and convenient if you are cooking small portions. The Rosewill air fryer is budget friendly compared to the other brands of air fryers.